So you’ve made a quilt that you love and now you are wondering how to display it so that you can see and enjoy it every day… or you want a way to quickly and easily change out your wall hangings for the seasons… OR you’re thinking that you are ready to enter your fabulous quilt creation into a show and a hanging sleeve is required to exhibit it. No worries! Today we will be learning how to make a hanging sleeve for a quilt- it’s really very simple! There are a couple of ways to make a hanging sleeve, today I will be sharing the most common method. Now, if you’re like me, you may be tempted to skip this step of making the hanging sleeve, because it does require some hand sewing, and you’re like- I just sewed all of that binding on, I do not want to do more hand stitching! But having a hanging sleeve on the back of your quilt makes it so much easier to hang your quilts and swap them out seasonally. Plus- it greatly reduces the stretching and distortion that will inevitably occur if you try to hang your quilt in some other fashion. Generally, the larger/heavier your quilt is, the more you need to worry about stretching. For miniature quilts, you can get away with hanging them with clips or with safety pins in the corners. But for larger quilts, by evenly distributing the weight on a rod, you greatly reduce the distortion than can occur. Generally, the bigger the quilt, the larger rod that will be needed to support it, so the wider the sleeve needs to be. Small, lightweight miniature quilts can hang on a 1/2” diameter rod, so they require a much smaller sleeve. For very large quilts, you may need 2 hanging sleeves. If you are entering your quilt in a show or exhibit, check the show guidelines/rules for the size and number of hanging sleeves required. Most quilt shows require a sleeve about 4″ wide. You can use the same fabric that you used for your quilt backing, so that the sleeve blends in, or you can use a different fabric or even muslin. For this method, we will be adding the hanging sleeve after the project has been quilted and the binding is complete. To make a 4″ wide sleeve- Measure the width of the top of your quilt. Cut a strip of fabric 8 1/2″ x the width of the finished quilt including binding (you may need to piece fabric together if your quilt is large.) So, for example, if your quilt measures 48″ across at the top, cut a strip that is 8 1/2″ x 48″. 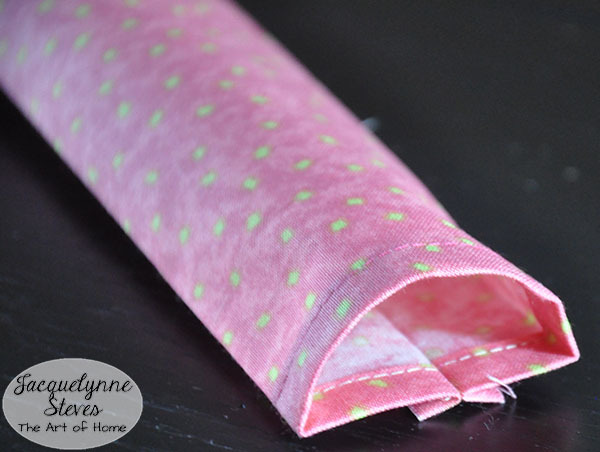 Fold both of the short ends under toward the wrong side of the fabric 1/4″ and press. Fold under again so that you have no raw edges on the short end showing. Stitch down using matching thread. Fold the strip in half lengthwise with wrong side together (right sides out.) 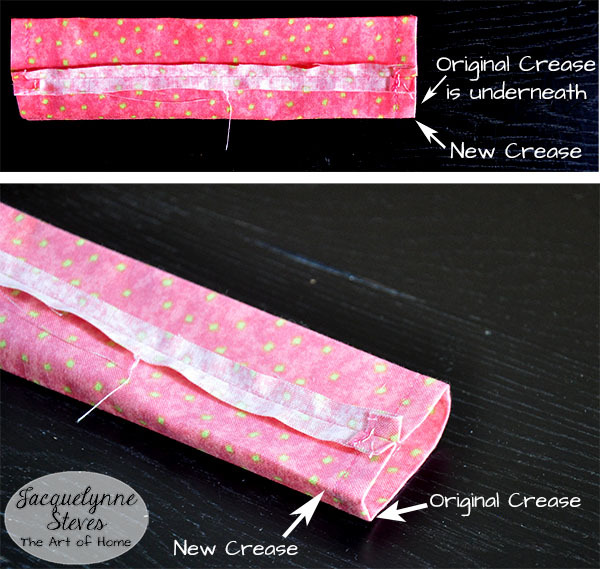 Sew along the long raw edges, using a 1/4″ seam allowance. Press the seam OPEN, centering the seam down the center of the strip. 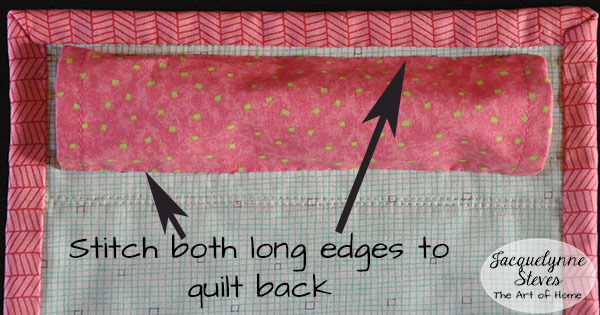 Pin the tube to the back of the quilt, about 1/2″ from the top of the quilt, so that the seam faces the quilt backing. 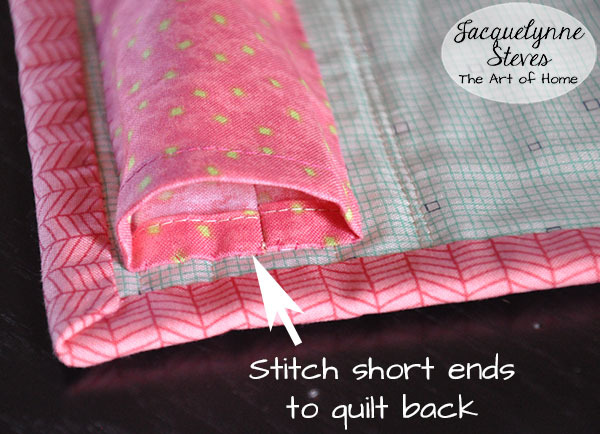 Hand stitch the top edge of the sleeve to the quilt, using a whipstitch or blind stitch. Be sure to catch the batting in your stitches to make the stitches extra secure, but be careful that your stitches don’t show on the front of the quilt. Hand stitch the bottom edge, being sure that you’ve got that extra room in your sleeve for the rod. Also stitch the short side edges to the back of the quilt. 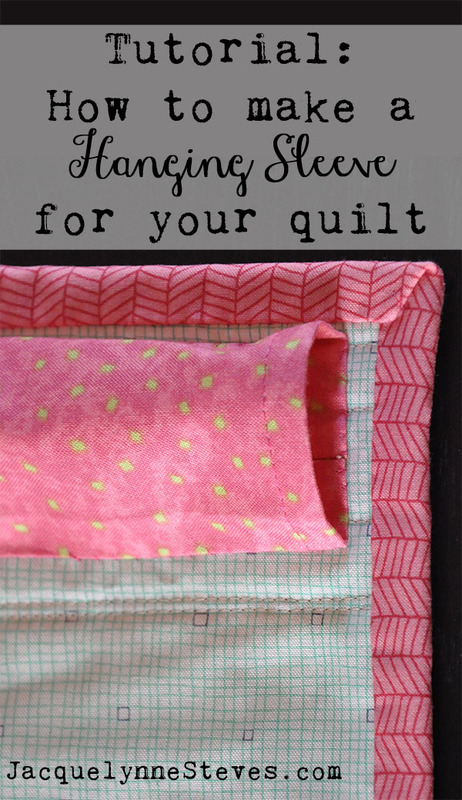 Now you can insert a hanging rod and enjoy looking at your beautiful quilt! Thanks Jacquelynne. This is something that I need to do more often so that I can display my quilts. Good instructions, easy to read and follow. Thank you, and oops, just dropped my quilt off at the hand in day and forgot to sew the two short ends down, o no!!! Hi Tina! Oops! You can probably just take a few stitches out of the end and tuck those edges under. Since you dislike the hand sewing part, I don’t understand why you wouldn’t sew the top edge of the sleeve into your binding seam sewn by machine. Then you only have to hand sew the bottom edge of the sleeve. (Yes, there is also a method to use the sewing machine blind hem-stitch to eliminate hand sewing altogether. I don’t mind the one row of hand stitching.) 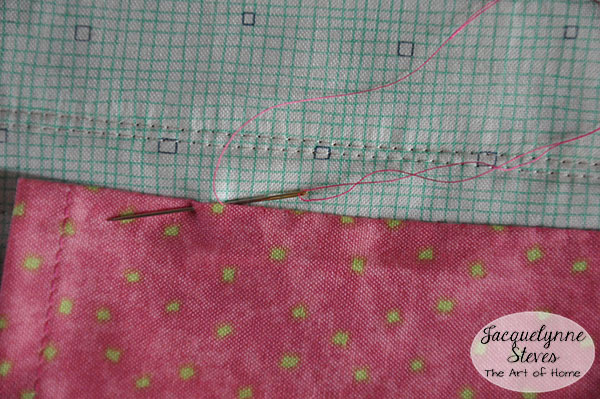 I sew in a sleeve on nearly all of my quilts, always included in the binding seam. Hi Karen! Yes you can do it that way. I just worry that when using a large rod, the sleeve will “peek” out from under the top edge, so I like to move that top edge down a little bit to make sure.